Tourism is New Zealand's biggest export earner, contributing 21% of foreign exchange earnings. 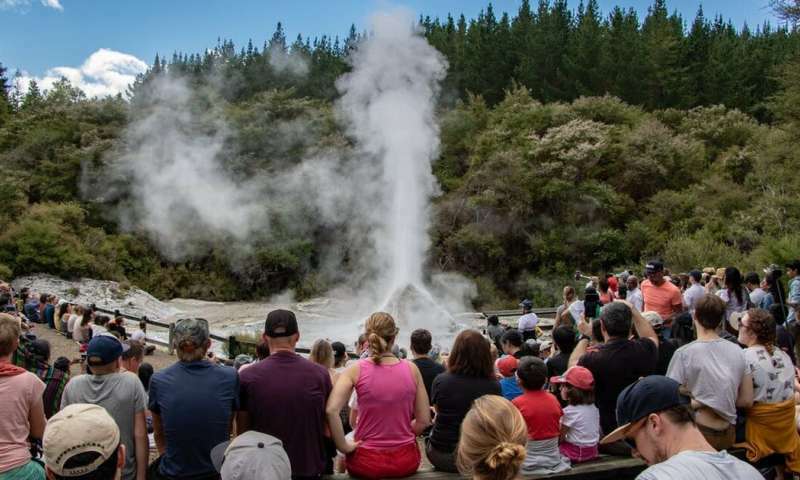 The latest data show tourists added NZ$39.1 billion to the economy and the industry has seen a 44% increase over the past five years. But tourism also brings unwanted pressures on infrastructure and natural resources. Recently, a conference focused on sustainability in tourism and how the industry could contribute to the United Nations' 17 sustainable development goals (SDGs), ratified in 2015 as the playbook for global development to 2030. The meeting challenged the growth agenda that continues to dominate thinking in the tourism industry. The rhetoric around the SDGs came under fire for being based on ideas of utilitarianism (maximising growth and profits) and managerialism (all problems are solvable with good management). An uneasy tension was evident in how sustainability is viewed. On the one hand, the narrative was one of hopelessness because sustainability in tourism is constantly counter-punched by commercialism and inequalities between locals and outsiders. On the other hand, there was hope. Sustainability in tourism should be possible because corporates allude to re-imagined approaches to social responsibility and indigenous tourism operators see SDGs as compatible with their values and needs. Here are five major insights on the role of tourism in sustainable development. They are full of contradictions and tensions, and born of an institution of ultimate compromise – the United Nations. The UN advances progress based on a "middle ground" approach. For now, the SDGs represent accepted wisdom about what a good life might look like in 2030. Sustainability requires a change in mindset, beliefs, assumptions, habits and behaviours – not just of some, but everyone. Everybody stands to lose if we do not achieve a more sustainable world. According to ancient indigenous wisdom, we are all interconnected, and the UN is beginning to appreciate that. The real challenge is how we institute a shift toward sustainability, after generations of market-driven economics that will not easily release us from its grasp. Like during all major disruptions, we must address root causes to procure lasting effects. In economic parlance, achieving a shift from growth to sustainability requires us to rethink the incentives and rules (carrots and sticks) we use to guide entrepreneurs and enterprises. We might see sustainability rise in the entrepreneur's estimation because of natural catastrophes, abhorrence at widespread poverty, and when consumers demand it. Companies and policymakers are a long way off working out how to do the SDGs justice, but some are making a pretty good start. One global tourism operator, for example, immediately after a major earthquake in one of its prime destinations raised $400,000 from an appeal. They also believed that getting tourists to return would offer longer term benefits to locals, so donated 100% of the profits from travel to the region in the year after the quake to the rebuild. Their philosophy: profit first, then purpose follows. More growth enables the company to do more good. This makes sense because you cannot help anyone if you don't have the money. But if you wait until you have money to have purpose, then sustainability is merely about economic attainment, only one strand of the many ideals within the SDGs. We should, instead, be aiming for 'inclusive tourism' which moves us some way toward tourism being the transformative, partnership-centred, equitable benefit-sharing between companies and local communities that might sustain people and environments over generations. Indigenous knowledge presents alternative sets of values and behaviours that are inherently sustainable and offer potential models. Indigenous communities are often deprived of opportunity and resources to develop sustainable enterprises of their own. Some indigenous entrepreneurs who start their own enterprises are affected by public doubt about whether they can or should do it. There is also the issue of how indigenous lands should be used – either for large-scale foreign-owned resorts that usually preclude local ownership or for small-scale locally owned ones that are accessible to locals. As tourists, tourism operators and tourism agencies, we ought to be prepared to look beyond the idyllic post card images to understand the undesirable consequences of tourism: waste, working conditions, water quality and impacts on the environment. It is important we become discerning customers who ask about sustainability of products and services.